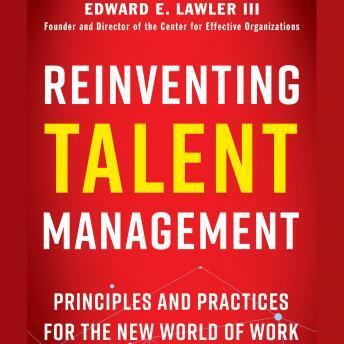 In this book, preeminent organizational scholar Edward Lawler identifies a comprehensive and integrated set of talent management practices that fit today's rapidly evolving workplace. The world of work has changed dramatically, says Lawler. Organizations now operate in a global environment. New technologies continue to disrupt how, when, and where work is done and should be managed. The workforce is becoming more diverse. Sustainability has joined profitability as a key business goal. All of this has dramatically accelerated the pace of change, making recruiting the best talent—not simply filling positions—an overriding concern. But too many organizations still use a job-based, bureaucratic talent management approach that doesn't take into account how the world has changed. Indeed, a recent study showed that from 1995 to 2016, there was no significant change in the way HR spends its time. Lawler says that talent management has to be reinvented. It needs to be closely linked to the organization's overall strategy. Recruitment and talent management should be driven by the skills and competencies the organization needs for long-term growth. This means talent management requires agile systems that can respond quickly to changing conditions and that take a more individualized approach to evaluating and rewarding performance. And everything talent management does has to be based on evidence, not tradition. Lawler looks at attracting, selecting, developing, rewarding, managing, and organizing talent through this new lens. In today's world, organizations have to constantly reinvent themselves—and talent management must do the same.